In a digital age, it can be all too easy to only learn magic through video after video. But books are where some of the GREATEST magicians alive discovered their secrets, and they are an often overlooked but priceless resource for the amateur magician. There are magic books that cater to all abilities, and today I will be counting down the top 5 books for learning card magic. This book is an iconic one within the magic community- and for good reason. It has helped countless magicians make the leap from beginner to advanced in their sleight of hand ability. However, you should bear in mind that it was written in 1940, so some of the terminology and writing may be a little difficult to understand, especially for a younger audience. This book is an absolute gem of information, but it can be hard to read and understand simply because there is so much material in it. 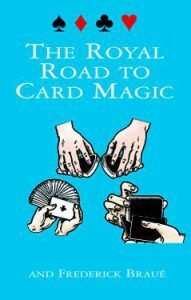 I would recommend waiting until you understand the basics of card magic comfortably before you consider investing in this book. Once you do so, however, you will be blown away with the sheer amount of techniques and tricks packed into this little book. This book also just happens to be an older one, but it has definitely stood the test of time in terms of its usefulness and practical knowledge that it offers to amateurs. 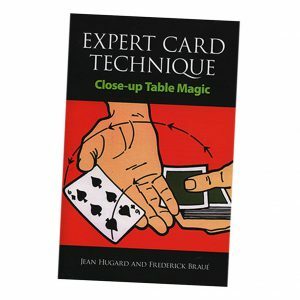 The book contains 76 different card tricks overall, with each chapter focusing on a different sleight of hand technique that is then applied to a few of these tricks. The author, Jean Hugard, happens to be the same man that wrote Expert Card Technique, and was a professional Australian magician who was one of the first to perform the ‘Bullet Catch’ using modern guns. He really knows his stuff, and this is evident in Royal Road, where he covers all the important sleights and tricks that a beginner magician should know in an informative yet entertaining way! This book is for those of you that perhaps are more partial to mind reading or clairvoyance than you are to card magic. Often regarded as ‘the Bible of mentalism’, 13 Steps is the best book on the market for amateur mind readers. Originally published as 13 individual booklets on different topics of mentalism, they were eventually combined to form this book. The techniques included range from ESP to telepathy, covering the secrets that magicians like Derren Brown still use today! 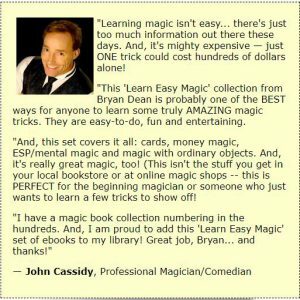 This book differs a little from the rest, mainly because it is actually an eBook- or, more accurately, a set of 4 eBooks offered by former professional magician Bryan Dean. During his career, Bryan wrote hundreds of pages of advice on magic on the About.com site. After publishing almost 100 tricks over 6 years, Bryan eventually left the site, and took the tricks with him. Now he has published the tricks in a collection of 4 eBooks, Learn Easy Magic, covering a multitude of topics. He offers the secrets behind his own coin magic, card magic, mentalism (or mind reading magic) and finally, magic that you can do with everyday objects. This book is good for those who aren’t sure which avenue of magic they want to pursue; you get a feel of everything! 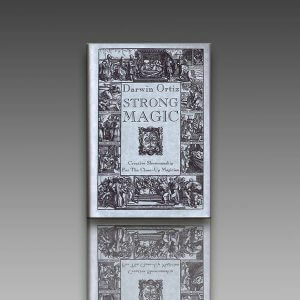 The best book for advanced magicians who want to break out onto the professional scene has got to be Strong Magic, by Darwin Ortiz. It doesn’t contain any teaching on card control, but what it does teach you is AUDIENCE CONTROL. Often, the difference between a good magician, and a professional magician, is not their technical ability. Many magicians have an incredible mastery of the cards, but struggle to make it, whilst some professionals rely solely on basic, beginner moves to achieve their effects. This is because they know how to work an audience; perhaps THE most useful skill a magician of any kind can have. Strong Magic teaches you exactly how to win over the audience, and why it is so necessary that you do. It is a great read, full of humorous anecdotes and gems of genuine wisdom. If you want to really make it as a magician, BUY IT. Of course, if you don’t have the necessary funds to invest in any of these, my advice would be to stick with YouTube until you are confident that you definitely want to take your magic further. You wouldn’t want to spend loads on a few books, then leave them to collect dust for a few years. Once you are sure that magic is for you, and you want to move beyond the types of tricks you will generally see offered online, these books are for you. If you have any questions about any of the books mentioned in this post, feel free to leave a comment below and I will get back to you! 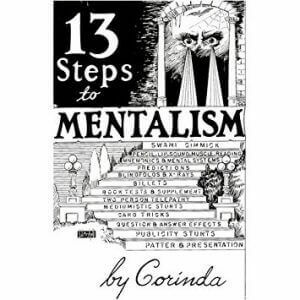 Awesome selection although I’d place 13 Steps to Mentalism just a little bit higher – I absolutely love the book. Thanks for sharing Benji, always great to read other opinions! Thanks for stopping by! Me too – it’s a classic in every sense of the word. How would you feel about a list of the best mentalism books (rather than general magic)?